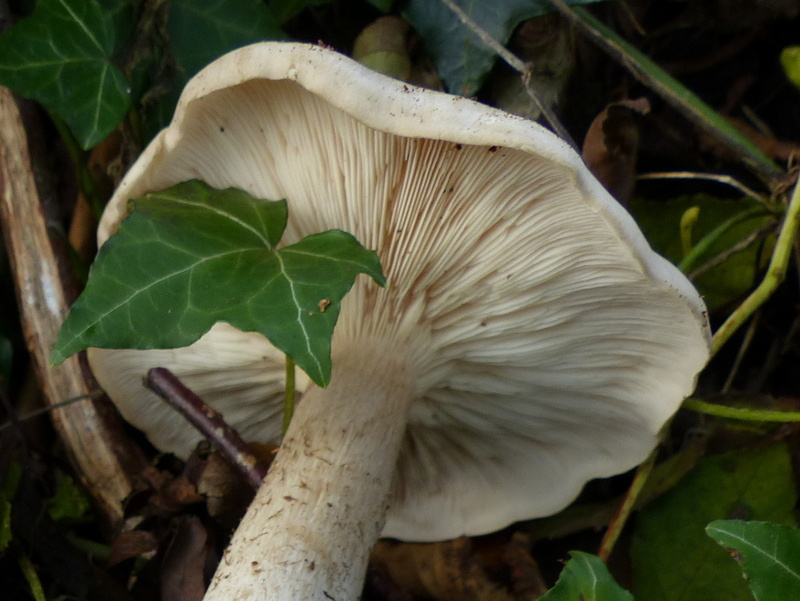 If I had found just one of these fungi on it’s own I would probably have passed it by. It would have seemed unexceptional and pretty indistinct to me. What made it beautiful was the scale. These were big mushrooms. So now we need to find out what it is. 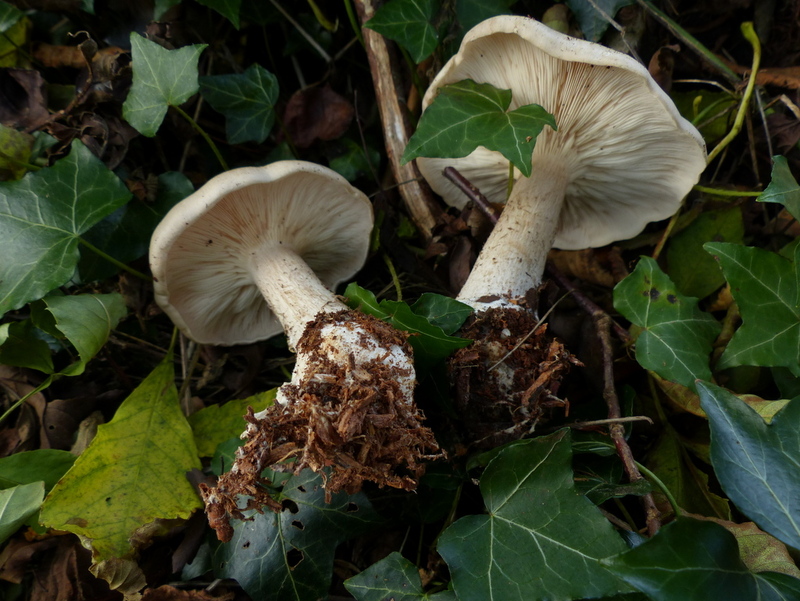 The pictures above are nice and they contain some important information but not enough for an ID. 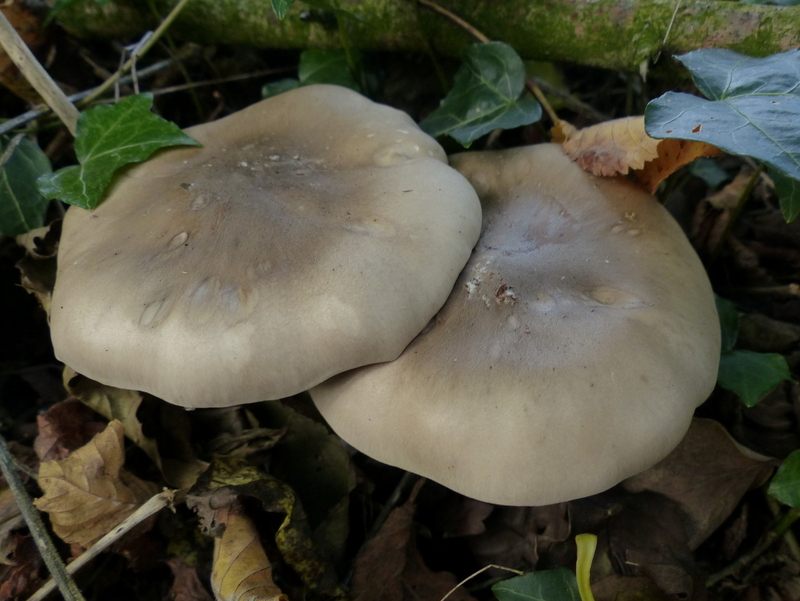 The cap colour is indicative, the name “Clouded” comes from the grey/white colour of the cap which is always darker in the centre and the crinkled edges of the older fruits are also true to this species but many fungi have these characteristics. 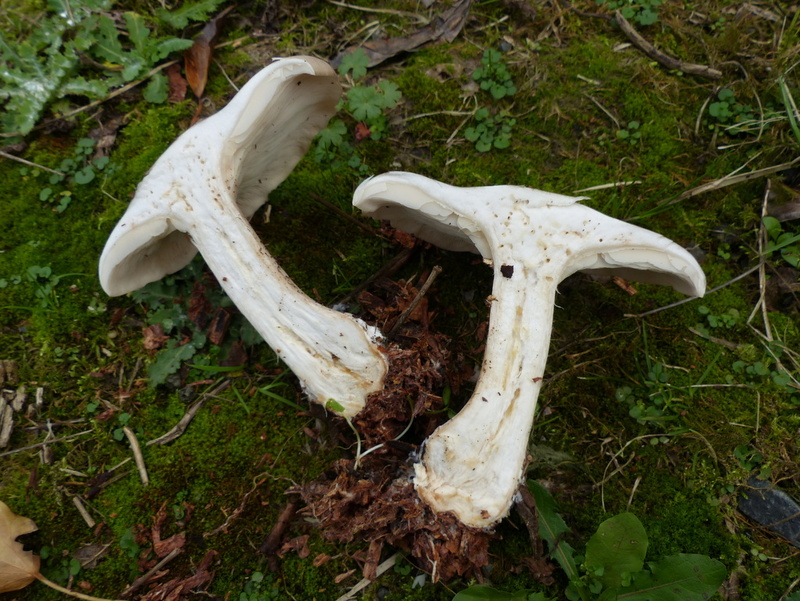 The other information that I am getting from these pictures is the way that they are growing together in quantity, that is also indicative of this species. We want to find out what it is, so I am going to gather as much information as I can. 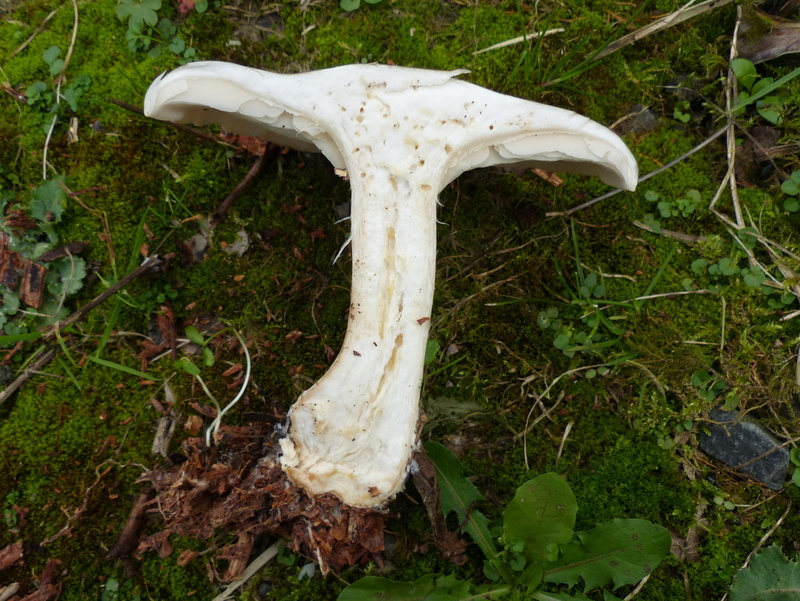 I need to look at the stem and the underside of the mushroom. Is there a ring on the stem? does it sit in a cup? Is it hairy or scaly? 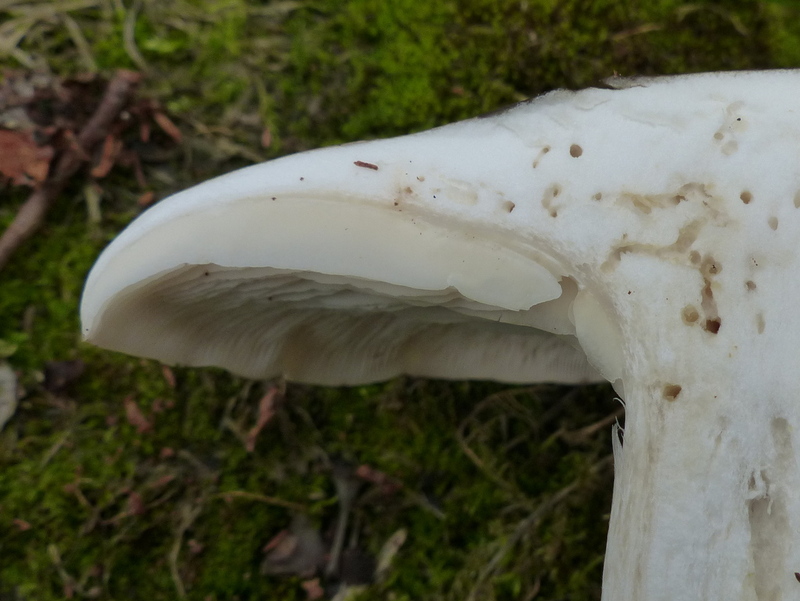 I need to know if this mushroom has gills, many of them don’t, they often have a flat porous underside and it is absolutely vital to record this. 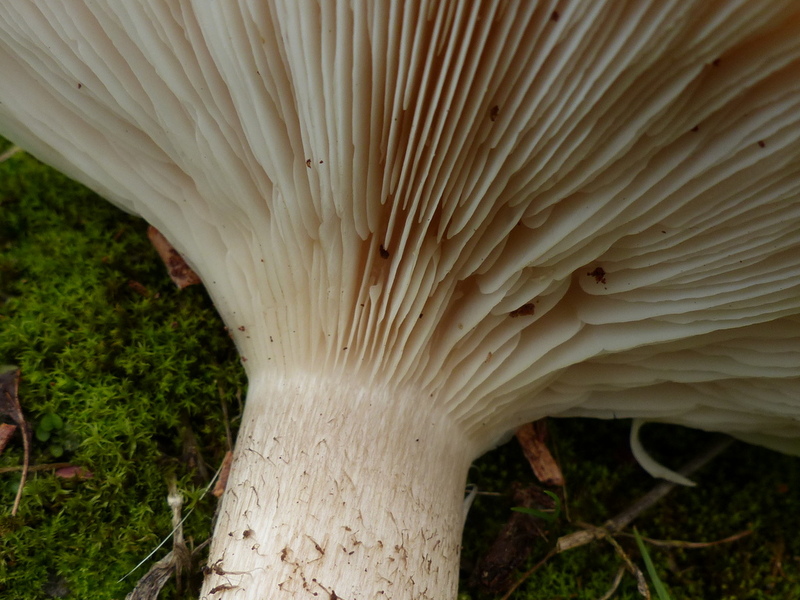 When I cut it I am looking at how the gills join to the stem and the colour of them. The way that I approach this is to try and photograph everything that I can possibly think of. 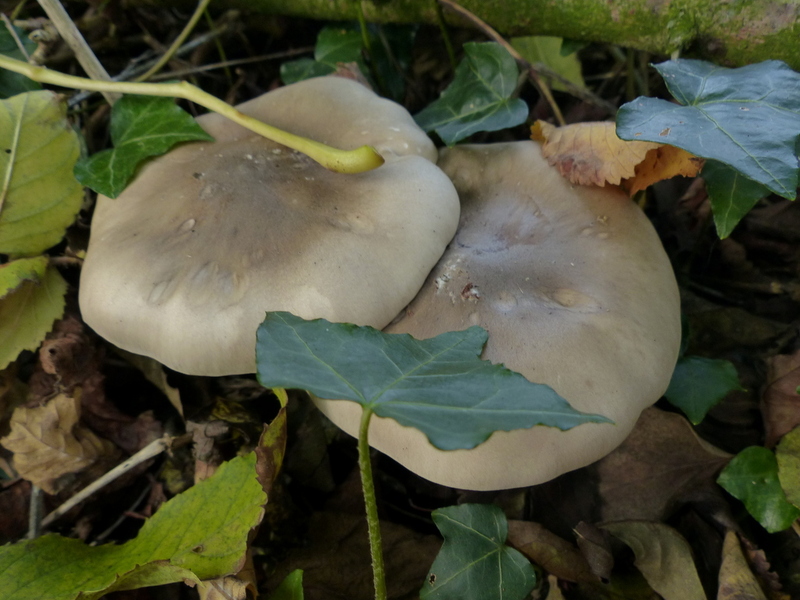 Even with these pictures there is still a very good chance that I won’t be able to identify the species. There are other things that you can look at. 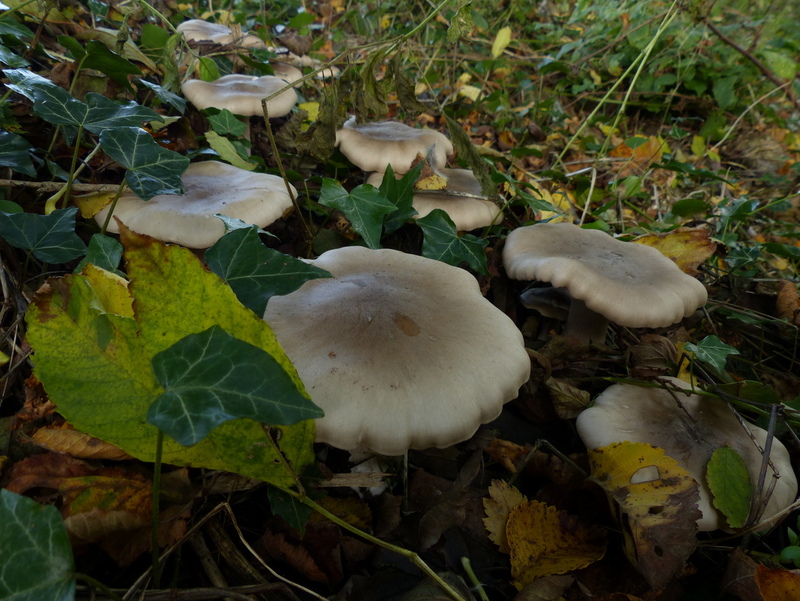 Does the fungi have a noticeable odour. 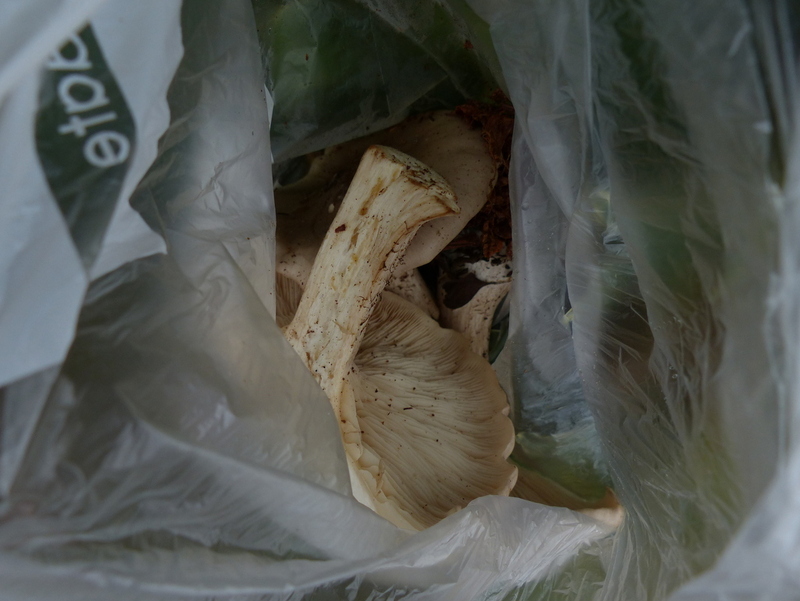 Sometimes scent is quite faint and the best way to smell a mushroom is to put some in a bag. Something else that you should look at is if it discolours when cut or bruised. Here is an old video of a friend and I demonstrating a fungi called Blushing Bracket. “Blushing” because it bruises very easily. 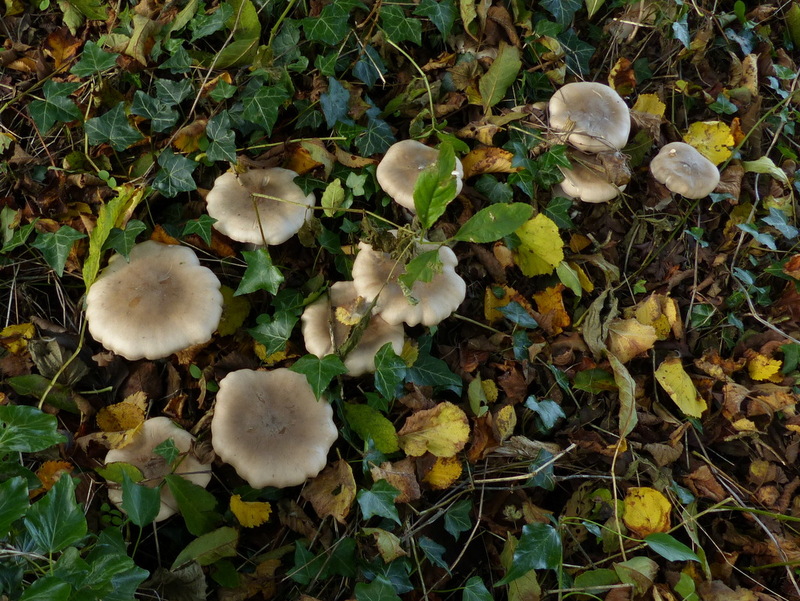 Some fungi does, ours didn’t. But it is just as important to know that it doesn’t discolour as it is to know that it does. The other thing that you should take note of is where you found it. If it was growing on wood do you know what kind of wood? What trees are around and what other plants. Soil type might be important and if you know what plants are growing there that can say a lot about the soil. If you don’t know then photograph them. The next thing that you can do is to take a spore print but up until now everything that I have done has been on location and has only taken me a few minutes. 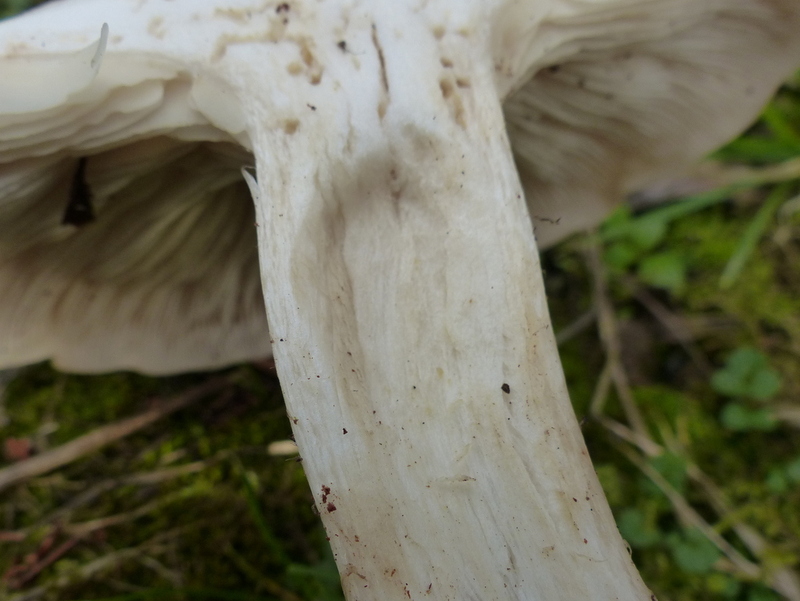 I didn’t need a spore print for this one so we will do that in another post. This may all seem like a lot of trouble to go to but this is what I like. 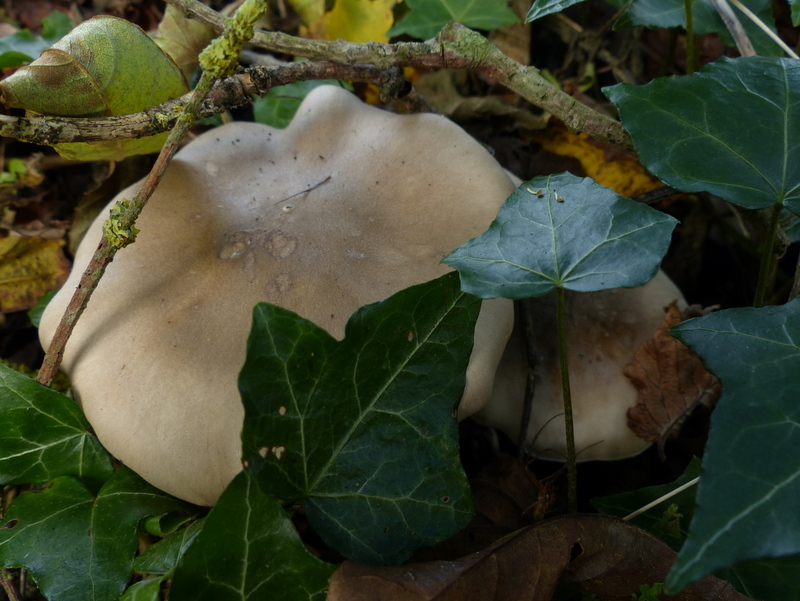 I go out looking for things that I don’t recognise and I identify them and learn about them. 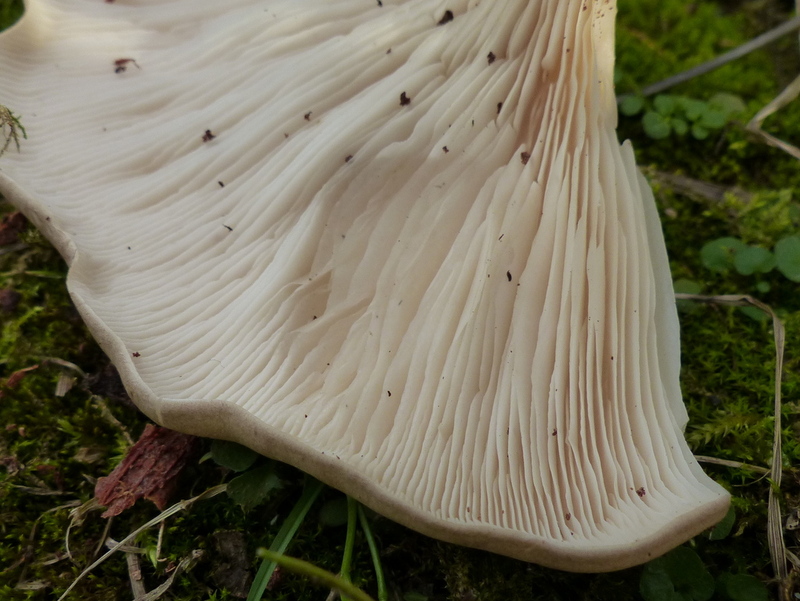 I was pretty determined to identify this mushroom. 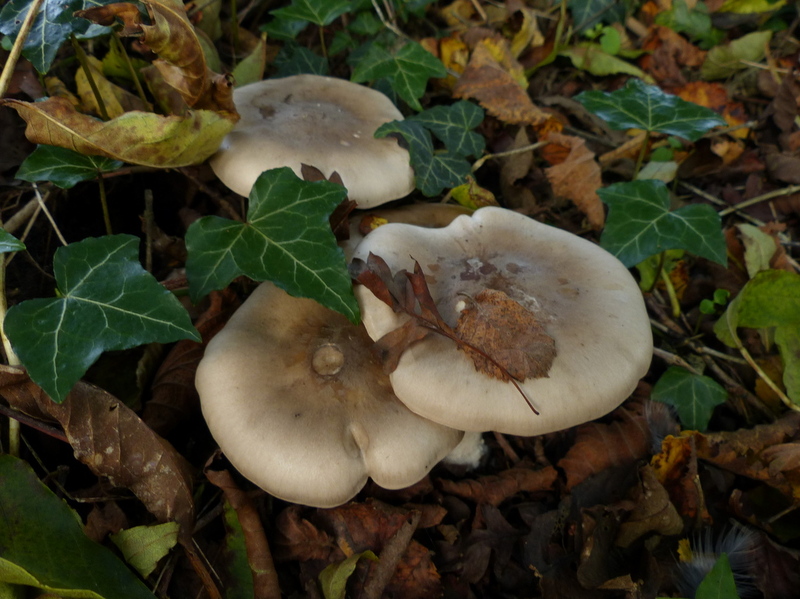 If you do want to identify a fungus then please at least give us the cap, stem and gills if it has these things. It makes it so much easier. So what did I get from all of this discovery? 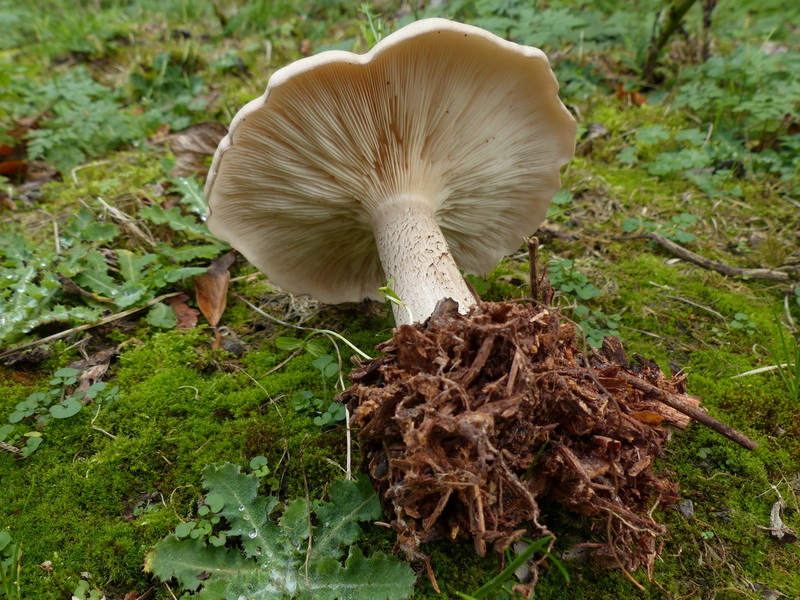 Note: there are a few white gilled, pale capped fungi that are more poisonous than this one. Make sure that you know what you are playing with. What a brilliant explanation of the process. Thank you Colin. Thank-you, Colin. 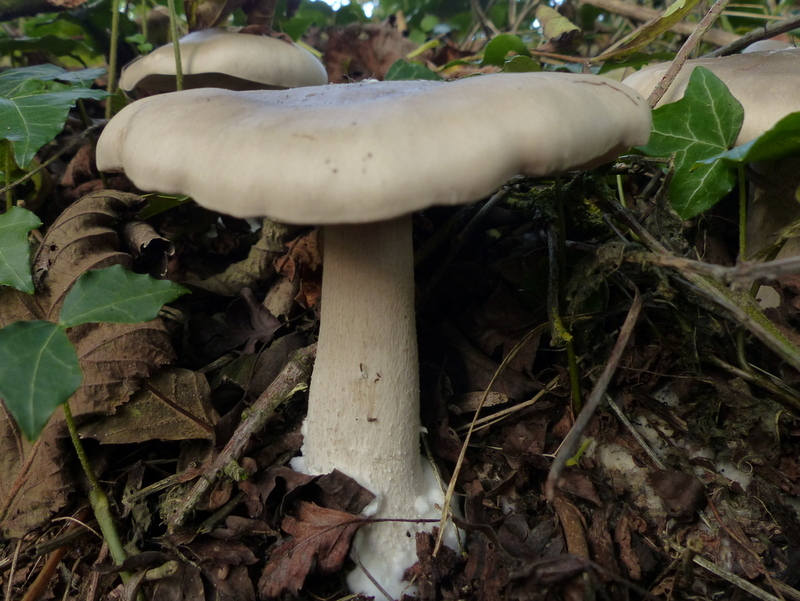 Really interesting post and I will note the method of IDing fungi for the future. Oh thank-you Colin! The red petals really confused me, and yet again I failed to photograph the stems, leaves etc. I had mulled over Beaked Hawksbeard for a while but I decided it really couldn’t be that. I then looked at Hawksbits but couldn’t find anything that looked more like this plant than Cat’s-ear did. Thank-you so much for taking the trouble for me. Clare. Very useful indeed. 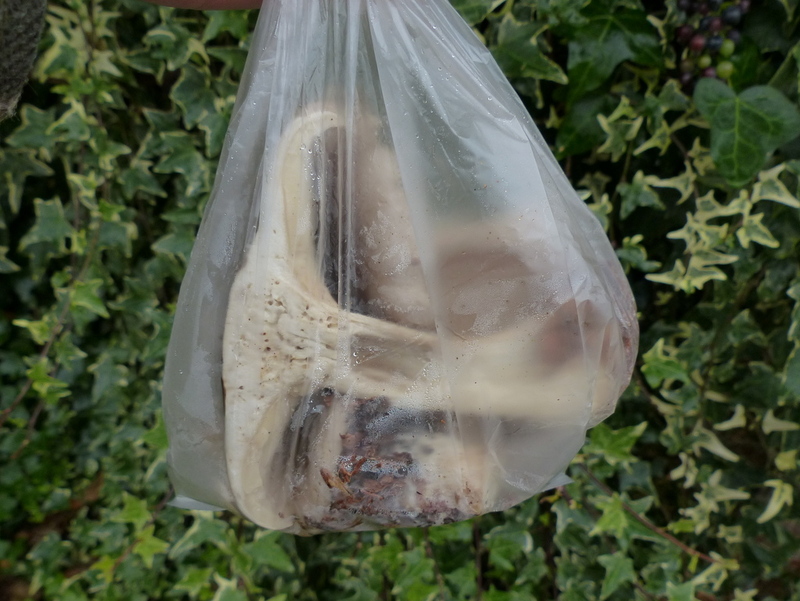 The idea of sniffing a shroom in a plastic bag sounds vaguely indecent. Can you do lichens, Colin? Thanks Andrew 🙂 In a word no. Well I can do a few of the very easy ones and I am planning a post about them. I want to write about the wonderful Beatrix Potter among other things. My problem with lichens is that many of them require chemical tests to identify them and enthusiasts go out with little bottles of Iodine, bleach, acid etc. Normal people don’t do that and I like to focus on things that you can identify by looking at them. 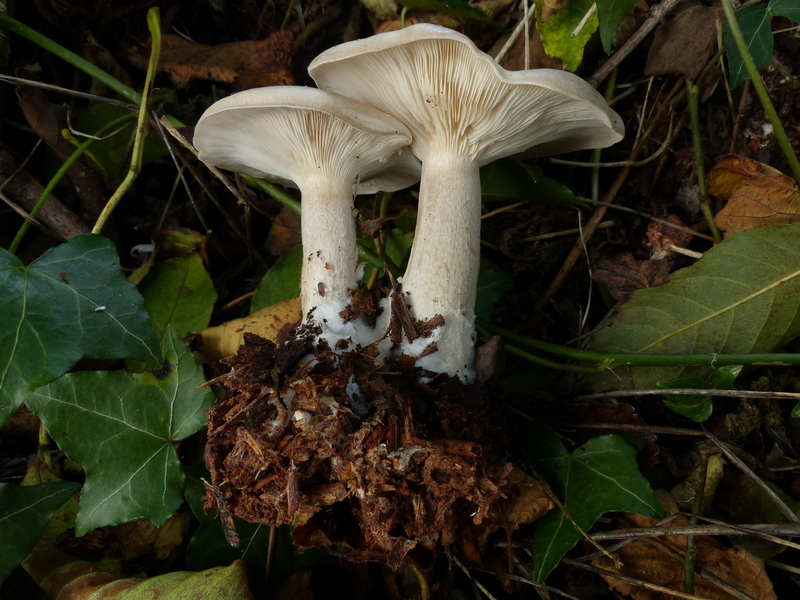 I am the same with Fungi, I look for the ones that are distinctive and easy to ID and try to avoid the ones that you need a microscope for 🙂 Lichens are wonderful though and I do need to write about them soon. I shall look forward to that Colin. You are a great teacher – thanks! Thank you very much Eliza 🙂 and you can have a star for that kind comment. Another interesting post. 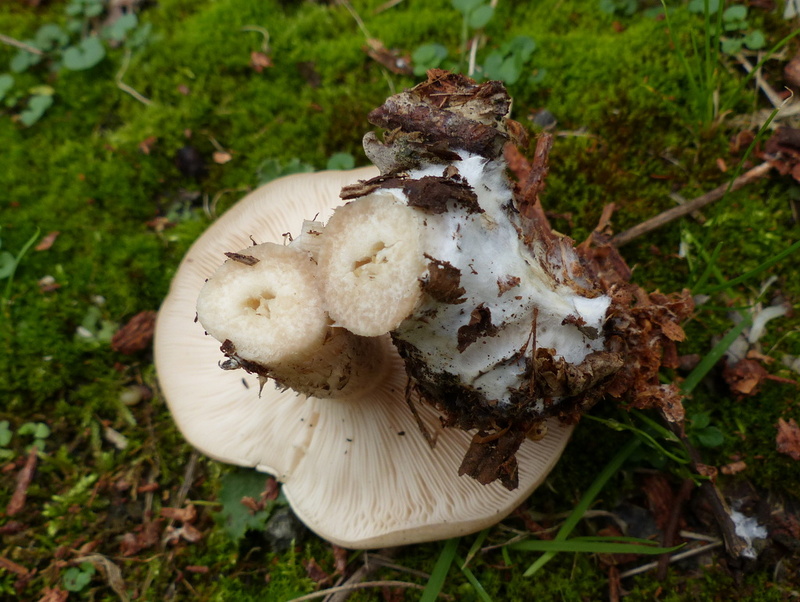 I went on a fungus foray last weekend and listened to a very interesting presentation before going out. One of the best presentations I have ever listened to. 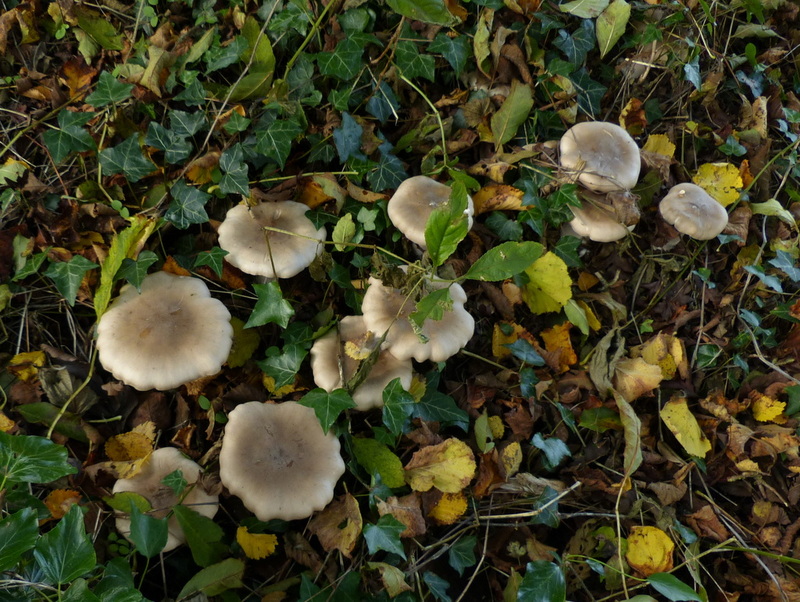 The presenter was Pat O’Reilly who wrote the book “Fascinated by fungi”. I need to buy this now.